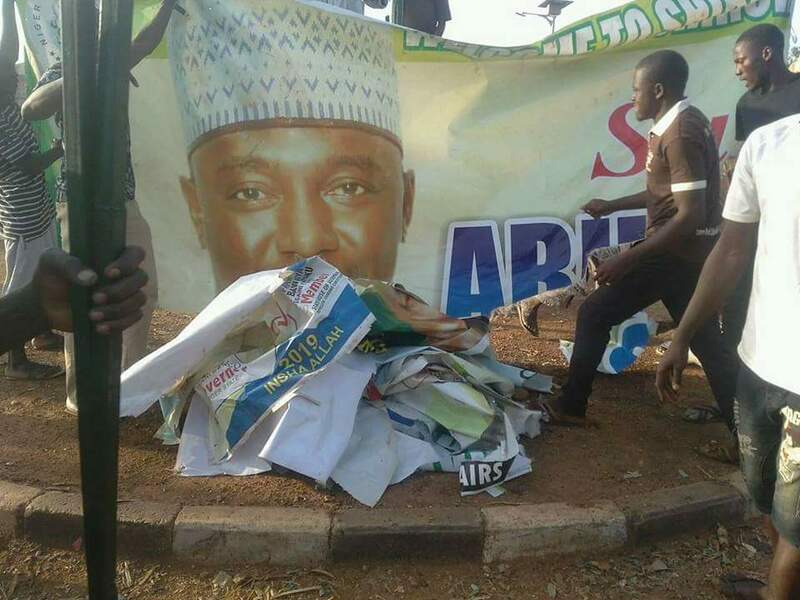 Youth in Gwada and Kuta towns of Shiroro LGA of Nigeria state have destroyed all political campaign banners, posters and billboards in their communities. The billboards destroyed include that of Governor Abubakar Sani Bello and President Buhari. The youth lamented negligence from political leaders who they say have abandoned them in darkness for almost 2 months now. Sani, a youth in Gwada who spoke to Nigerwatch Newspaper said we have being in darkness for the past 2 months yet we have a hydro power dam in our local government. Husseini Kuta who also spoke with this Newspaper said, “we have being in darkness for over 3 weeks, no cable or transformer damage, AEDC just want to exploit our people and we will resist it by all means”. The problem was reported to have started after the community and Abuja Electricity Distribution Company, AEDC agreed that each household will pay 1500 Naira as electricity supply bill, only for AEDC to turn around and start demanding 3000 Naira which they say is unaffordable for them, since then the power generation company has switched off the electricity and no one has come to their aide including politicians in the state. It will be recalled that last week, another youth group issued a 48 hours ultimatum to AEDC to either improve electricity supply or pack out of the state. The AEDC public relations officer, Mr. Adamu Mohammed said, the electricity supply to those communities were disconnected for non- payment of bills, but only yesterday (Wednesday) the Senator form the Zone David Umaru came and we met and some monies were paid and power has been restored to those communities.